The Lupine Blika X4 SMARTCORE: Camping, Hunting, Fishing, Biking, Running, Climbing, Skiing: When developing the Blika, we asked ourselves what a lamp has to do to enable a broad spectrum of activities at night? Features: A fully adjustable spotlight (up to 2100 Lumens!) for fast journeys and challenging terrain; when you want lots of light and a broad, homogeneous illumination pattern. Integrated red and green lights that can be adjusted in steps for special applications requiring special lighting. Full control: access to all lighting levels and special functions in every situation. Diffused reading and camping light for those times you need 'less' light. 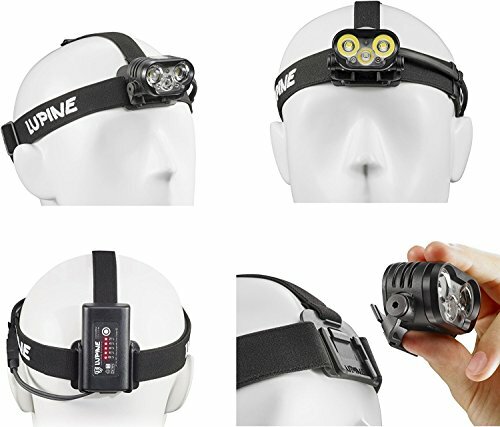 FRONTclick quick-change system; turn your headlamp into a helmet lamp or swap your headlamp from one helmet to another in just seconds and without any tools (click into place onto the plate attached to your helmet with a special 3M adhesive pad or the tried and tested Lupine velcro system; additional mounts/ Velcro/ 3M pads sold separately) The Lupine FASTclick System allows a change of batteries within seconds. (additional FASTclick batteries sold separately) 2100 Lumens; 50g Lamp; 3.3 Ah FASTclick SMARTCORE Battery; Runtime 1:05 - 80 Hours; 250g Total System Weight SYSTEM INCLUDES: Blika 2100 Lumen LED aluminum lamp head, 3.3 Ah FASTclick SMARTCORE battery, headband with FRONTclick Lamp mount and FASTclick battery mount, Wiesel V4 battery charger, and Blika manual. 3.3Ah Lupine FASTclick SMARTCORE Battery (120g) and Blika manual.